Since I last wrote about cycling in London there have sadly been yet more deaths. It’s been a horrible week with news out daily about another death or serious injury. Whilst we don’t yet know the exact causes, each death has occurred as a result of a collision between a cyclist and a HGV or bus. It again raises questions of sharing road space with such large vehicles. The bad news will inevitably put people off attempting to cycle, though given how dicey cycling already looks on narrow cramped roads many are already reluctant to try. I am sure that a large number of segregated lanes would do much to encourage people nervous about cycling to give it a try. The prospect of jostling with lorries and numerous buses is not appealing to the vast majority. There have been calls to ban HGVs at peak hours. Whilst that may be a decent start, though how feasible I don’t know, HGVs will still be around off peak, and nothing can be done about buses. The UK and London does suffer from a lack of proper street planning stretching back decades or more, resulting in tight twisty roads as well as numerous side roads and junctions, making travelling for all forms of transport difficult. Sadly the broad streets seen across Europe, America, Australia and Asia are very rare here, and we do not have the luxury of streets wide enough for cars, buses, trams, cyclists, and wide paving for pedestrians existing side by side. 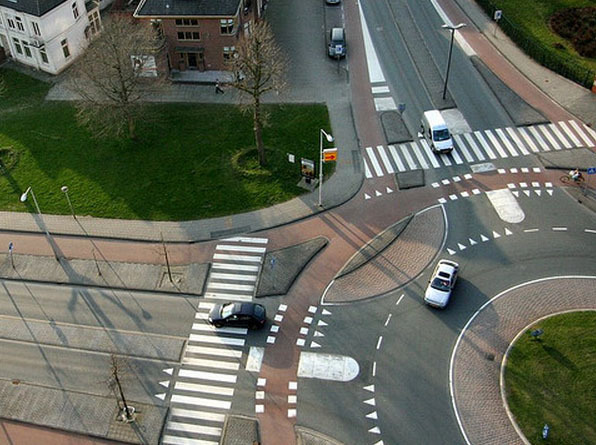 However sometimes we do, and traffic planners and highway engineers often seemingly show a complete lack of imagination when changes occur on the wide streets we do have. The main road from Plumstead to Woolwich is a great example. It was a three lane road in each direction – two lanes for cars and a dedicated bus lane with very wide paving alongside. It was altered to become one lane for cars, one for buses, and a cycle lane installed. The reduction of two lanes to one for cars caused massive congestion on the single lane approach to the road that never existed previously. Presumably this was either a surprise to planners, or was to encourage modal shift. It didn’t. This change delayed many buses trying to navigate the newly gridlocked approach road and was terrible for anyone trying to cycle. It cost millions, took a year to build, failed on day one and then much more money was spent changing some of the layout again back to what it was. It is still worse than it ever was before for cyclists, bus users and cars. Image below courtesy of Google Maps. The cycle lane is somewhere in the middle of all that traffic. This is taken at a quiet time. The cycle lane isn’t segregated so cyclists have to contend with many buses pulling in and out of stops along the road. Cars also regularly park on it. A far better solution would be to put the lane in the very wide space used for paving segregated from the bus lane and bus stops. The road actually starts in Plumstead where the Ridgeway begins/ends. The Ridgeway is the path atop the sewer bank running arrow straight from Woolwich to Thamesmead. It is suggested in Greenwich Councils new consultation on cycling to become a dedicated cyling lane bypassing traffic completely. It is quite possible to install cycle lanes separate from traffic accessible to most people in north Thamesmead leading to Abbey Wood and Woolwich town centres and Crossrail stations. After the roundabout the dual carriageway section to Thamesmead begins. The paving is narrower here. Either the whole road could be shifted to the right which would be expensive, or a cycle lane installed on the road. The extensive guardrails can be substantially reduced. They are a danger to cyclists who can be squashed against them, are ugly and also expensive to install and maintain. Greenwich council love them and still install them any chance they get despite there removal from many other areas. After this short stretch the dual carriageway to Thamesmead begins to ascend to the right as seen below. To the left a local road peels off leading to a grim pedestrian/cycle bridge. There is more than enough space for a separate cycle lane away from the road and traffic along the pavement behind the bus stop. The bridge further along is being renovated right now with 100k of funds from the Cory Environmental Trust. ‘The Eastern Way Bridge, over the A2016 in the centre of the Thamesmead flyover, is a key link between north and south Thamesmead and is set to be transformed. Bexley Council has secured the funding from the Cory Environmental Trust in Britain and members of the public will even be asked to design a landmark feature on the route. I think there are road closures planned to carry out the work imminently. The ugly concrete pedestrian bridge seen below is also soon to be demolished as the Thamesmead regeneration of Tavy Bridge into Southmere Village continues. At the end of the local road to the left is the entrance to the Ridge heading east/west, and the cycle/pedestrian only bridge heading north. This area has been quite isolated and off-putting for many people. However a multi-million pound new community centre has just been built next to it called ‘The Link’ bringing some life to the area, and hopefully the refurbished bridge will have good lighting. I would again remove the guardrails from the approach below which add nothing. Spend the money spent installing and maintaining them on better lighting and painting so it is not such an intimidating space. The cycle ramp can be seen in the image below leading up to the bridge which heads over to Thamemead. An aerial image shows the existing bridge as the red line. The blue line to the south shows the approach as seen above. The purple lines running east/west are the Ridgeway. It heads west to Plumstead Road where far better cycling provsion could be installed, as written about above. 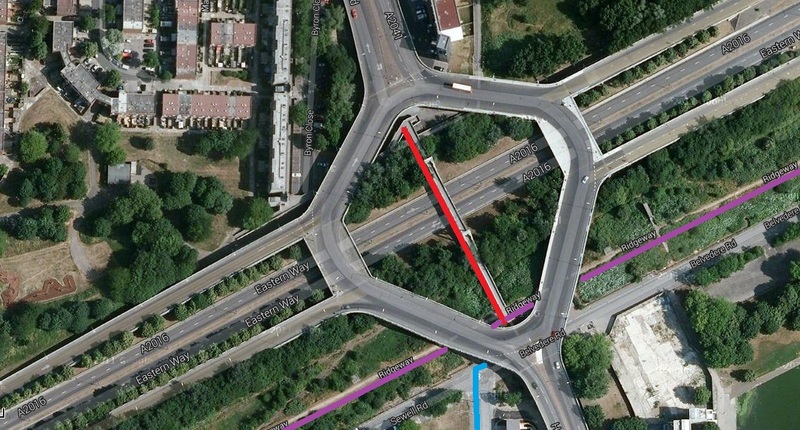 With the segregated lanes Thamesmead would have quick, safe and usable cycle lanes separate from traffic, buses, lorries, and congested spaces heading all the way from much of Thamesmead to the local major transport interchanges and shops. Thamesmead really needs better and this would be a relatively cheap way of doing so. All that would then be needed are secure, safe cycle storage spaces by the new stations (there is definitely space by Abbey Wood Crossrail station on Felixstowe Road for this) and it would be a great encouragement to try cycling. In the UK cycling is mainly the preserve of a narrow demographic. Radical changes need to occur to make it safer and encourage a more varied selection of people to give it a try. The odd cycle training day at schools or community centre’s will not do this without radical changes and segregated paths.